Anemometers - see the Equipment page. Beaufort Scale - summary with Beaufort Scale / knots / mph / conditions. Meteorology - excellent introduction from UKDivers.net. Satellite images from the Dundee Satellite Receiving Station. 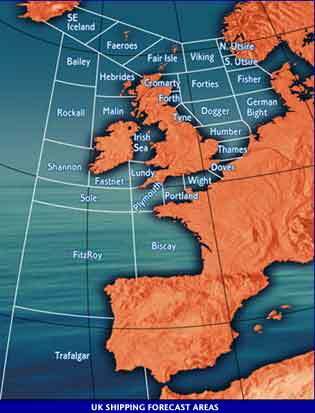 Understanding the Shipping Forecast & Inshore Waters Forecasts - explanation of the format and terms used in the Forecasts. Understanding Synoptic Charts - how to read those squiggly lines - from The Great Outdoors. Understanding Wind (part 1) /Understanding Wind (part 2) - highly informative .PDF Factsheets from Cailean MacLeod explaining the effect of wind on sea paddling. Weather - article on understanding weather from the BBC, with background on how the weather works. The Met Office also has a comprehensive set of Factsheets. BBC Weather - as good as any. See the Trip Planning Synopsis for a variety of weather information sources and forecasts. Observations & trends are shown here. Southampton Water - Bramblenet has local data. As does Chichester Bar. Yachting & Boating World brings Weather, Tides and Synoptic charts all together here - charts are a bit small, but useful none the less - they have a useful "24 hour history" wind graph linked from the Forecast Data pop-ups. Scotlandonline.com - UK 3-5 day inshore outlook from the met office for free! Westwind has lots of lovely technical stuff, if you understand it! Wetterzentrale is a nice German technical site, in German! But http://www.wetterzentrale.de/pics/bracka.html will give you a proper synoptic chart for Europe! A1 Surf - viewer friendly surf site with wave data, forecasts and summaries for all the major surf spots in the UK. magicseaweed.com - brings you detailed surf forecasts, surf reports, surf webcams, wave buoys, surfing photos and more surfing information all updated every six hours from the latest available data. National Data Bouy Centre - the original data source for most of the previous sites, this takes you straight to the raw info! NOAA weather buoys See what's coming, wind speed, direction, air temp, dew point, air pressure and trend, wave height, period and sea temp. Wavenet, DEFRA's "Strategic Wave Monitoring Network for England and Wales" - lots of good stuff on waves, including bouy data for England & Wales.